The weather has been terrible. 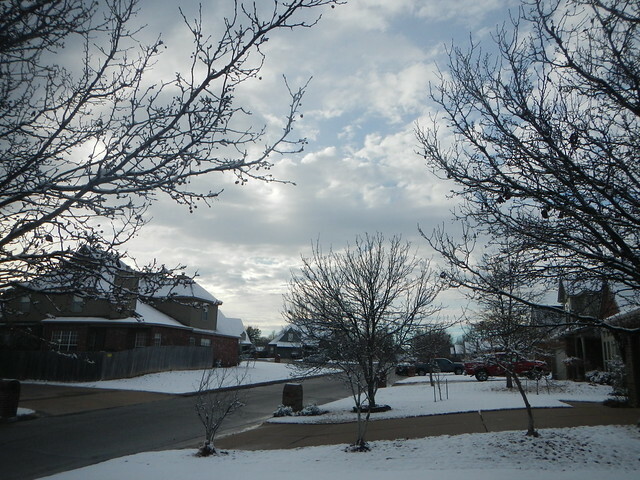 We had a little bit of snow, not much. I am cheating with this December 2014 photo of the snow in our neighborhood. 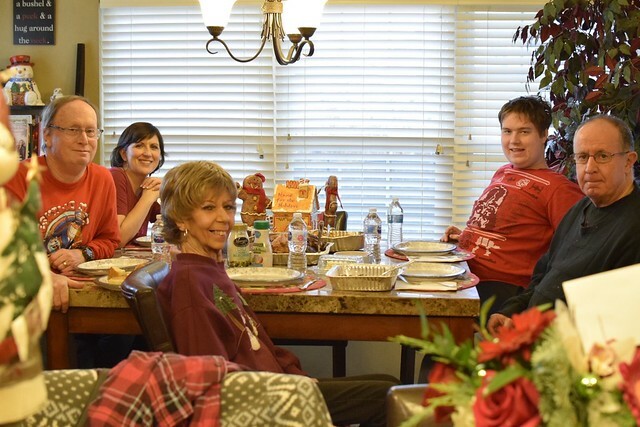 We had a pretty good Christmas with the world’s greatest MIL, Nana, and them I am to the left, then Heather, then Logan then my brother Bob on the right. 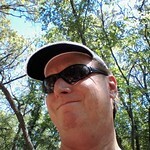 I liked the way this photo turned out although my professional photographer friends are groaning. The white balance, the busyness, all the water bottles, blah blah blah. I like it is all I’m saying. 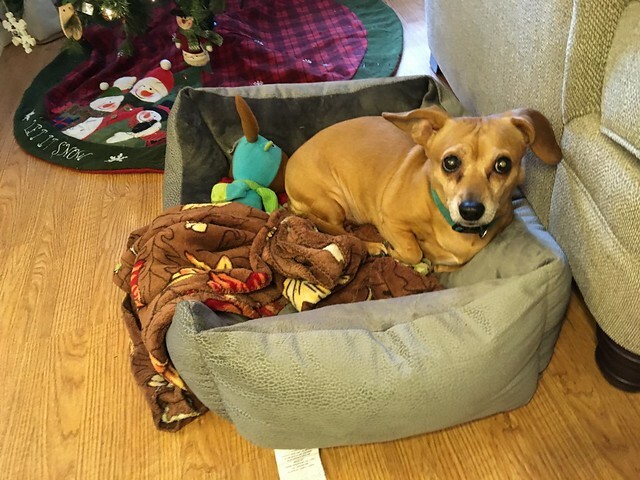 Ginger, the always freezing dachsund spent a lot of time in her bed with a fleece throw. She is wants to move to Mexico, or Spain, or some place warm all year round. And the Lizzie the kitten during her Christmas afternoon nap. She goes either 100 miles or an hour or is sleeping, with stops for eating. I don’t think she is going to get very big but look at them huge jack rabbit legs. What is up with that? She is not a hold me kitty but I love how she is interested in everybody and anything. and never loses her cool. We adopted her from our Vet. She was thrown out of a car window at a Hobby Lobby here in Tulsa when she was very little. My favorite gift. 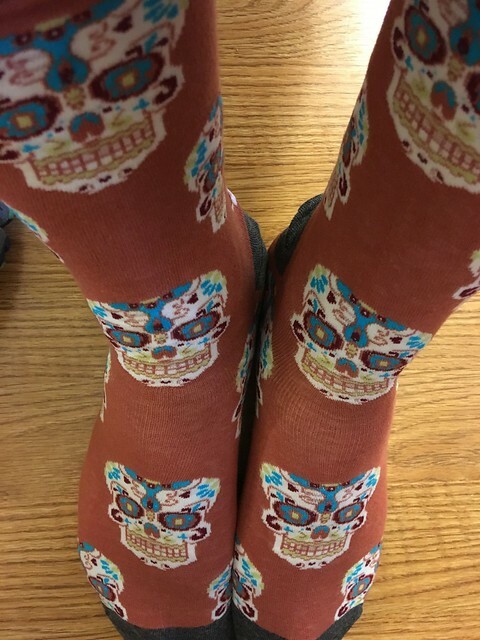 Heather got me some skull socks. She knows that I love the Day of the Dead holiday. I love these almost as much as my Psychobunny socks. I have Psychobunny pajamas and a hat also. Don’t you judge me!! I hope you had a great Christmas!! This entry was posted in Skywatch Friday and tagged Christmas, Skywatch Friday on December 27, 2017 by Alan Bates. Hey, it’s a photograph of a family being a family. That’s all that is required to be a good photograph. Wonderful family photo ~ (never mind what the pros think) ~ Love is there ~ And your doggie and kitty steal the show ~ adorable! Hello, wonderful family photo. I love Lizzie and Ginger too. Pretty sky shot. Wishing you and yours a happy New Year. Enjoy your day and the weekend ahead. And a Happy New Year. Beautiful sky. Ginger sounds like our chihuahua… has to be 75 in the house or she’s shivering. She usually climbs under her down blanket and stays there when cold. Glad your Christmas was a good one, and have a happy new year!! Wishing you and your family a very Happy New Year . Awww – love those socks! The weather is horrible here too. Happy New Year! Happy New Year to you and your family and Sleeping Kitty. Who cares about balance and composition when it’s your family. Love the socks! I’m a strange sock fan, too – I have one with the Sunsweet Prunes label and another with WD-40. Maybe I’ll wear my chili pepper socks today. Its a great family photo! Looking at your pets, makes me want to go to bed now. It time to say good night and sweet dreams. Lovely, warm and fuzzy, as family will ever be! Nice way to end the year and usher in the new one! Happy New Year for 2018! Cute pets and I love the family shot. Happy New Year! Looks like you and the family had a Merry Christmas. It snowed here in Breckenridge, too – about 2′, so we finally have some white. Our 3 oldest Grands arrive tonight to celebrate the New Year with us. Happy 2018, Alan, to you and your Family. I like the way you framed the family portrait. Great socks! Wonderful shots – I like it when people show real life in their blogs (and super-duper professional shots are also OK). The socks are AWESOME. We plan to dress up like Day of the Dead next Halloween! 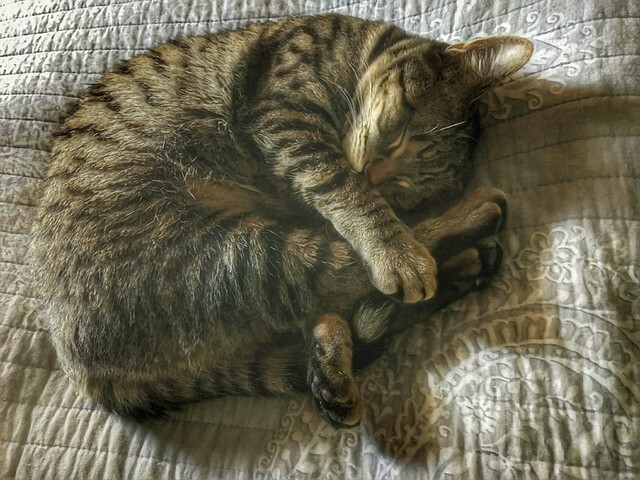 I can also relate to your cat comments – sometimes I have to touch our sleeping cats to make sure that they are still alive! Happy New Year to you.